Apparently in tribute to the NFL’s championship games Sunday, the Bulls went into their prevent offense late Saturday and with one basket in the last 5:17 fell to the Washington Wizards 96-93. The Bulls did defend well down the stretch, forcing Washington into missing five of its last six shots. A Kirk Hinrich forced 19-footer with the shot clock about to expire was the only one of the last eight Bulls shots to go in. 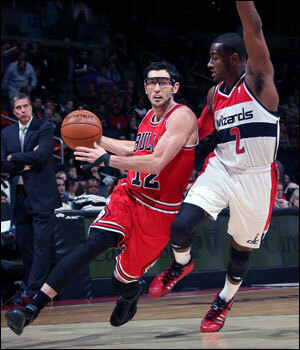 Hinrich scored a season-high 18 points to go with five rebounds and five assists, but the Bulls fell to the host Washington Wizards 96-93 on Friday night. Which raises the big question for the Bulls: If vegetable oil is made from vegetables and corn oil is made from corn what is baby oil make from? No, sorry. That’s a different question. Do you win a game by scoring more points than the other team or stopping them from scoring more points than you? And so Bulls coach Tom Thibodeau had to make the call again Saturday in Washington with his imperfect roster. Here was the situation: The Bulls had given up a 70-62 lead in the third quarter after John Wall with an impressive 23 points and 11 assists turned another Bulls turnover into a score, this time with a behind-the-back, over-the-shoulder, how’d-he-do-that bank, one of 25 points the Bulls would give up from turnovers. This is likely always going to be an issue with this Bulls team. They try to move the ball and did have 24 assists on 35 field goals. But several of the players who do so are not guards. Obviously, a lot of offense is run through Joakim Noah. He had his career-best 11th straight double figure rebound game with nine points, 12 rebounds and six assists. But Mike Dunleavy had four turnovers and Carlos Boozer three. Both can be loose with the ball, though they are good and willing passers. Their passing is important in the offense, but turnovers are a larger problem again teams like Washington which want to push the ball. So the Bulls giving up more than 50 percent shooting the third straight game sounds worse than it is. They are playing hard. But they are giving up a lot of points in transition, and they are getting beaten somewhat on the perimeter as Thibodeau has worked in rookie Tony Snell and Augustin. Snell had eight points and five assists in another good effort. But you hear Thibodeau yelling his name a lot during the game when the team is on defense. It doesn’t appear to be in congratulating him. So here was Thibodeau’s dilemma down the stretch with the Bulls leading 91-90 and Hinrich having his best offensive game of the season with 18 points on eight of 15 shooting. Should Thibodeau go with the offense, perhaps Augustin with Hinrich in the backcourt? He had Dunleavy in and put Boozer back in for Taj Gibson. That should produce enough offense with his best defensive players in the game in Hinrich, Jimmy Butler and Noah, and then trying to switch Boozer and Gibson as much as possible on dead balls and timeouts for offense and defense. The Bulls did stop the Wizards. Most of the time. Thibodeau left Snell in after the Hinrich pull up with 5:17 left for the 91-90 lead. Snell lost Trevor Ariza and in Noah going out to help, Ariza rifled a pass into Marcin Gortat for a layup and 92-91 Wizards lead with 4:28 left. Thibodeau then took out Snell for Dunleavy and thus kept in offense. But the Bulls began to fire primarily from the perimeter. It actually was a good offensive game from the Bulls with 46.1 percent shooting and nine of 24 on threes. 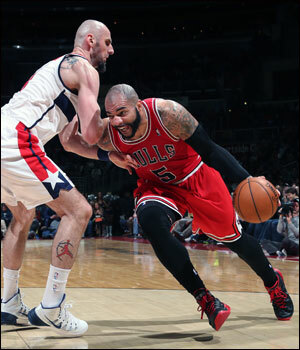 Plus, the Bulls were able to stay with a higher scoring Washington team in a game with 12 lead changes and 11 ties. Hinrich missed twice, and then with Boozer in the game, Noah went to help on a Wall penetration off a high pick and roll and Gortat slid in for another score and 96-91 Washington lead with 2:46 remaining. That’s when Hinrich coming out of the timeout made the last Bulls score on a broken play. But while the Bulls then got three good defensive stands, they couldn’t get anything going offensively with Butler pulling up for a pair of well off threes. Noah rebounded the second. But he threw the ball away trying to get it out to Snell. Gibson missed a quick jumper from the baseline with 30 seconds left in the game and the Bulls still trailing by three. He then elaborated after a pause and it was difficult to make it more than a second guess. Thibodeau’s reasoning was reasonable. The Wizards with Wall and Bradley Beal, the latter with 14 points, were a potent pair in the game. The Bulls basically shut down Washington the last three minutes. But the Bulls couldn’t score. Their shot selection wasn’t great. And they did even get a last chance for a tie after that Gibson miss. With a six second differential, the Bulls appropriately elected not to foul trailing 96-93. The Wizards, now 19-19, gave the Bulls some help as Nene put up a shot with six seconds on the shot clock. It was denied and Noah was fouled on the rebound. The ball went to the Bulls with 10.4 seconds remaining in the game. The final play, however, broke down. Butler, Snell, Hinrich, Dunleavy and Noah were on the floor. Butler inbounded and it seemed Dunleavy was supposed to make a play. It looked bad from the start as Butler inbounded to Dunleavy. Wall did a heck of a job jumping over to Dunleavy on the pass in as the spacing wasn’t good. Dunleavy then gave it right back to Butler and Wall recovered quickly to get back to Butler. Wall was impressive in the game and should be an All-Star this season. He’s always had the great speed and athletic ability. But he played like an Olympic track star instead of a basketball player. No more. He’s developed a respectable jump shot. And while he still makes some erratic plays, his speed often makes up for it on defense and in finding players on the break. So he passed back to Butler. Butler tried to make a move on Wall but couldn’t. Butler dribbled back to the left, where Nene picked him up on a switch. Butler dribbled back right and couldn’t lose Nene. He pump faked, but Nene stayed down. Butler then went up for the shot with just over a second left. Nene blocked it and when the ball came down the game was over. 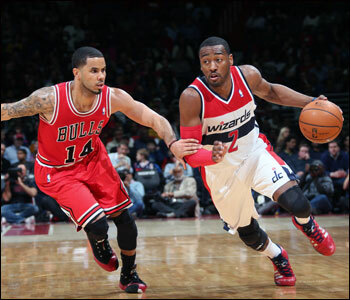 The Bulls fell to 18-20 with their second loss in eight games, both to Washington. The players afterward talked seemingly out of habit about defensive problems, which they always do when they lose. The Wizards did shoot almost 70 percent in the first quarter. Though the Bulls shot 50 percent and were much more efficient offensively in trailing 30-27 after one. The Wizards were racking up points scoring inside, though more after turnovers. Still, the Bulls did have problems early as they did in Orlando in being beaten off the perimeter and the interior players closing late. It’s been an issue of late that Thibodeau and the players talk about addressing, though they did tighten up quite a bit after halftime. Snell after shooting well in Orlando did a nice job playmaking in the second quarter. And Hinrich continued to be as aggressive as he’s been all season on offense, driving the ball and seemingly delighting in crossing over Wall, whom he played with in Washington when Wall was a rookie backup. Behind Hinrich and Boozer the Bulls took a 70-62 lead midway through the third quarter and seemed like they had a chance to pull away. But the Wizards regained equilibrium thanks to that amazing Wall basket after Dunleavy lost the ball and Wall took off running for the score. Dunleavy tried to wrestle him down and Wall spun and tossed the ball in backward like we’d see Michael Jordan try when wrestled in a break. Martell Webster and Trevor Booker off the bench with a combined 11 of 19 shooting hurt the Bulls again as they did Monday in the United Center in that Washington blowout win. And the Wizards tied it at 74 going into the fourth quarter. The Bulls surged out again as Snell opened the fourth with a three and the Bulls got an 83-78 lead after a Butler steal led to a Gibson jumper with about 10 minutes left. But Beal got loose for three scores after early foul trouble as the Bulls again had difficulty containing guards on the perimeter off the pick and roll as they did with the Magic and the Wizards earlier in the week. Still, the Bulls were good enough to counter all the Washington scores with a terrific Noah pass to Butler on a backdoor cut and Hinrich again losing Wall and making that 20 footer with 5:17 left for the 91-90 lead. You hold the opposition to six points the last five minutes on their court and that should be good enough to win. Not for these Bulls, who needed more offense down the stretch. Though perhaps if they had it, they wouldn’t have been able to hold the Wizards to six points and then no one would have noticed the last shot strategy. So why do they put round pizzas in square boxes? There are just so many questions, questions, questions.